I’ve partnered with ALDI to show you how you can save money on these yummy ingredients. 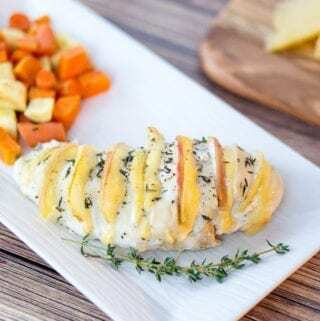 I’ve been indulging in my favorite fall dishes and my recent obsession with Hasselback chicken has created another yummy recipe. 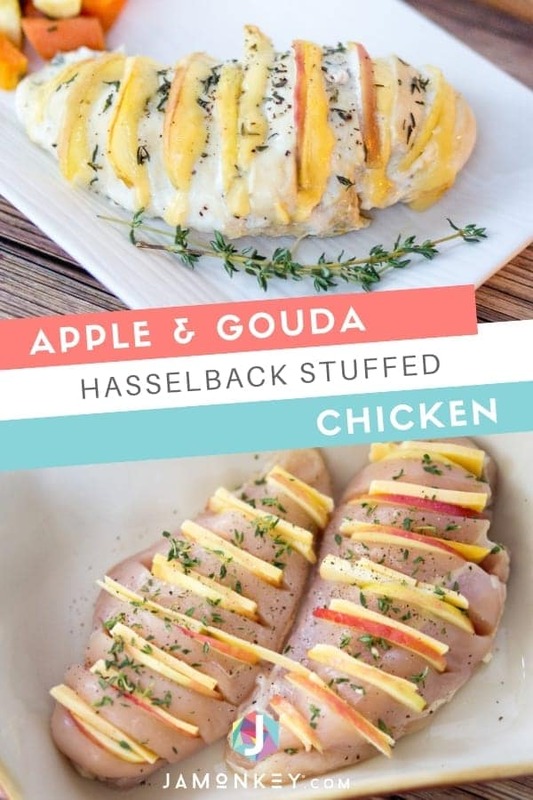 This apple and gouda Hasselback chicken is really easy which is what I love about these recipes. They are so simple and add a lot of flavor to your chicken. You only need a handful of ingredients as well. Shopping for the best ingredients is easy at ALDI. Aside from local produce, they offer a lot of organic options that my family loves. Plus, I can get in and out with what I need fast. ALDI doesn’t have non-essential services, like in-store banking, pharmacies and check cashing. I love the ALDI Brands like SimplyNature, liveGfree, and Never Any! The options that ALDI has in their stores make it easy to provide great food for my family at a much lower cost. 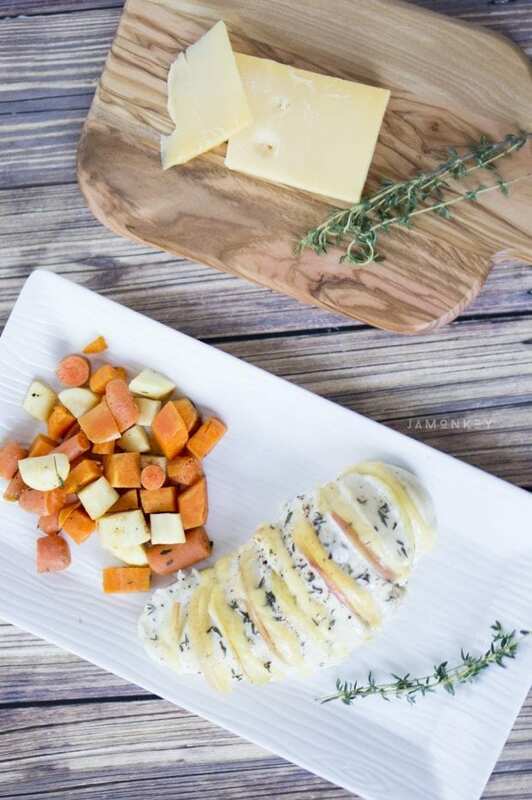 For this recipe, I compared the prices of the chicken, apples, and the gouda to a national competitor’s store and you can see the savings. 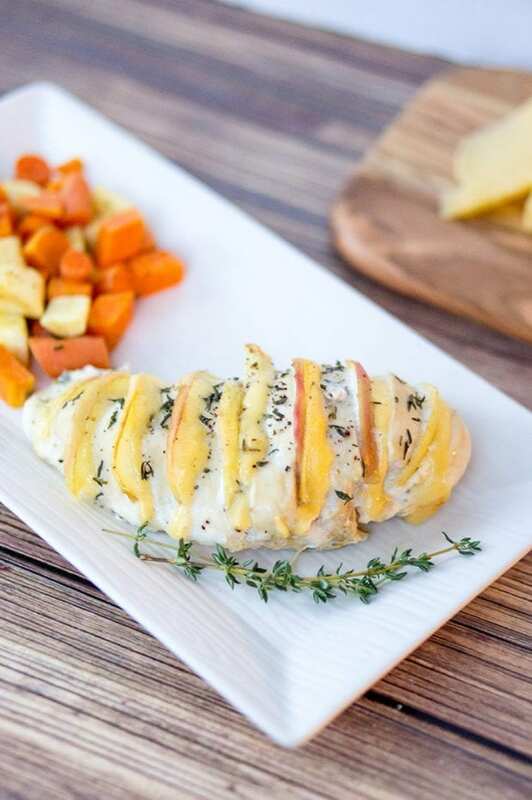 To make Hasselback chicken you just need to cut slices into the chicken without cutting all the way through. You want it to stay one whole piece of chicken that you will stuff with your ingredients. Thinly slice the apples and the gouda cheese. 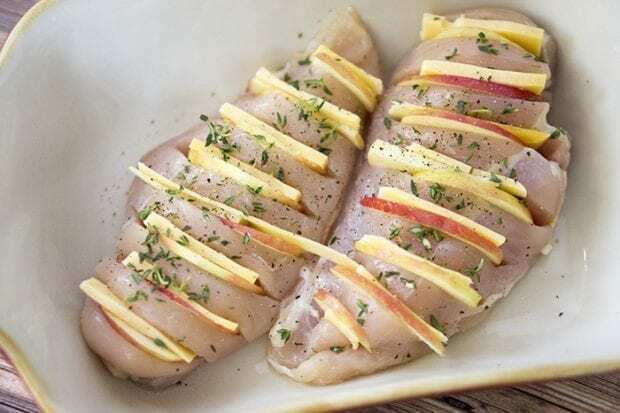 Place an apple slice and a gouda slice into the slices of the chicken. I was grazing on the yummy Gouda cheese while I was slicing. Apples are one of my favorite fall flavors. I love using apples in everything. I also made a yummy roasted root vegetable medley with parsnips, carrots, and sweet potatoes. I seasoned the chicken and the vegetables with thyme and a tiny bit of sea salt and fresh cracked pepper. I cover the chicken with aluminum foil so that the cheese doesn’t burn before it is done. During the last few minutes of baking, I take the foil off to brown the top a little more. My family loved this recipe, and if I don’t eat all the gouda, I’ll be making it again soon. Buying nice cheese isn’t something we do a lot, and I like that I can save money when I buy it at ALDI. We buy all of our snacks from ALDI for the girls to munch on after school or in their lunchboxes. ALDI keeps their costs down for shoppers by going back to the basics because they know that sometimes less is more. Even with a smaller shopping space that only has about five aisles (hello, quick and easy shopping! ), there are so many great things to choose from. Oh, and don’t forget your quarter for the cart! 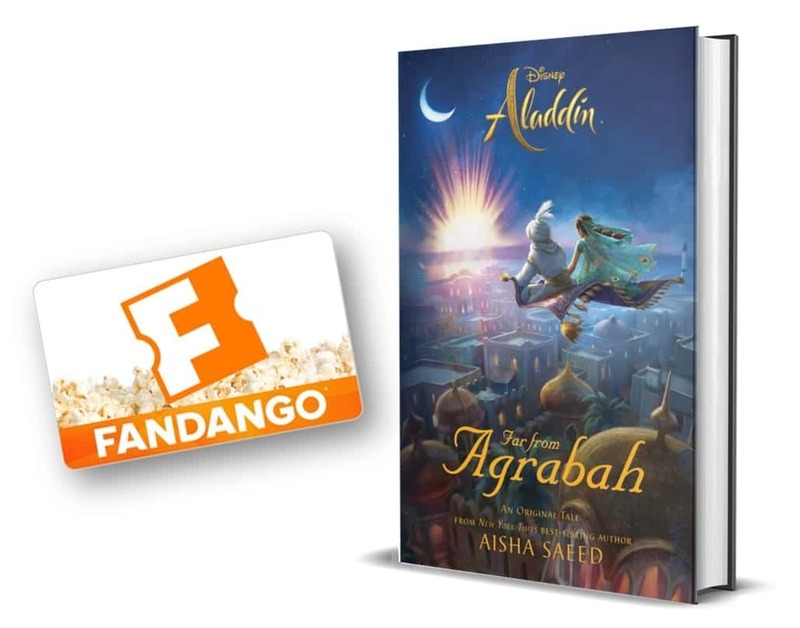 By doing this deposit-per-cart method, they make sure that their staff has more time to serve you inside the store, which is a huge win for us as consumers. 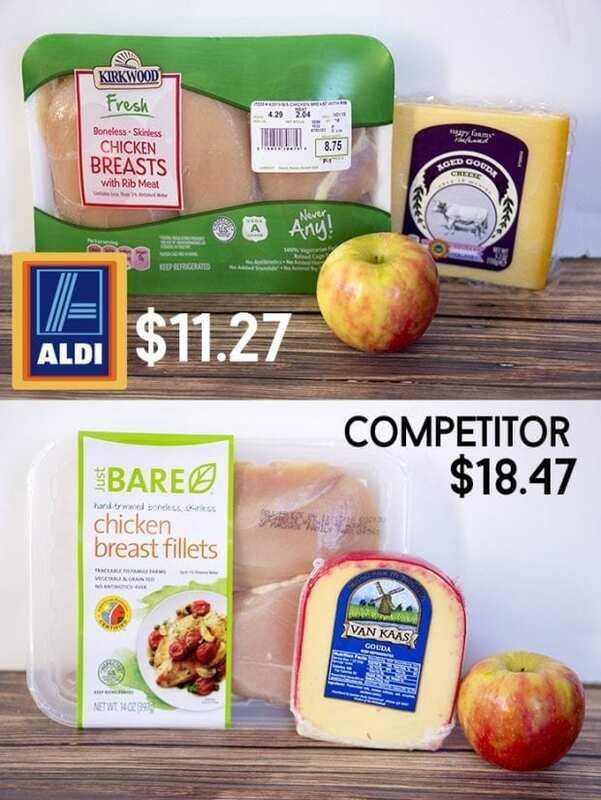 Do your own comparison of your receipts from ALDI and another national grocer to see the savings! These methods work! I foresee more Hasselback recipes in my future; I already have a handful that I want to test out and try. It’s such an easy way to jazz up your chicken. Slice chicken 3/4 of the way through making sure not to cut all the way through. Season with freshly chopped thyme, salt, and pepper. Place chicken in pan and cover with aluminum foil. $7 is a TON for a price savings on a meal. $21/day and that adds up to $147 a week. I love shopping ALDI first for everything. This looks sooo good! My boyfriend and I are going apple picking this weekend and I definitely plan on using part of our haul to make this. Do you think it would taste okay with haralsons? I know they’re tart and more of a “baking” apple, but I’m thinking it won’t be quite as potent once they’re cooked, and I feel like the savory flavors might cut down on the tartness too. I’m a fan of all apples and the main thing you have to remember is that most apples get sweeter when baked. The only ones I don’t like using in any baking or cooking is Red Delicious because they fall apart and are grainy.